Roulette is the most recognisable and popular of all the Casino Table Games. Players place bets on individual numbers, or combinations of numbers between zero and 36. Each number is either red or black, with the zero traditionally coloured green. To give a range of bets numbers are categorized by colour, odd or even, high and low, and their layout on the board. 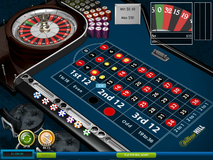 Bets are made by placing chips on the table which cover individual numbers, combinations of numbers together, or whole sets of numbers. 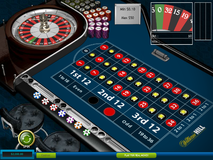 Outcomes are decided by the croupier spinning a numbered wheel in one direction, and then spinning the ball on a tilted track in the other direction around this. When the ball loses momentum it will land on the wheel and settle in one of 37 numbered slots. This number is the winning number and all bets featuring this number win and pay out, while all bets not covering this number lose. Roulette payouts are show in in image 1, these are based on the likelihood of each bet winning. This is done by considering the amount of numbers covered against the total numbers on the table (i.e. 37). Table limits (the amount you can stake on each bet) correlate to the odds, with bigger bets only possible on the shorter odds outcomes. Many players will scatter chips across numbers, with more chips on certain numbers than others. This would give a scaled payout, meaning some numbers could bring huge profit, while other single bets could still win, yet leave the player with a modest profit or even a slight loss. If any number lands not covered by the player all bets are lost. 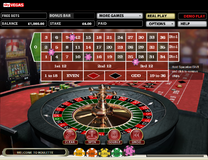 The simplest bet on roulette is to put a chip on a single or several single numbers. Image 2 shows number 33 being bet on. The return is 35/1, as there are 36 numbers (one of which is the number being bet on). Because the zero exists as an extra (37th) green number this gives the casino it’s edge. The green can also be backed as a single number, or in splits/streets/corners (see below) at the same odds of any other number. In image 3 the bet covers two numbers, in this case the zero and number 2. This is called a split bet. The chip is shown placed on the line between the two. This is twice as likely to win as the single number bet, and pays at 17/1 (2 of the 36 numbers are in the bet, and any given pair of numbers therefore has a one in 18 chance of coming in). If players combine chips on a single number, and a split with that number, they will be paid out twice at the appropriate odds for each bet. are covered. As the bet has to cover 4 numbers in a square the corner bets will not be sequential (in this case number 24 is missed off). The odds on a corner bet are 8/1 and this will pay off equally whichever of the 4 numbers is landed on. A corner bet has twice as much chance of coming in as the split bet above, covering twice as many numbers. This essentially covers two split bets, and effectively allows a smaller stake per number. A bet on six numbers is known as a line bet. In image 5, numbers 7, 8, 9, 10, 11 and 12 are covered. The chip is placed between the banks of 3 numbers, and on the outside line of the board. If the bet was not touching the edge it would simply be a split on the two nearest numbers (in this case 7 and 10). The odds are 5/1 to reflect the fact the board is made up of six blocks of 6 numbers (plus the zero). There are strictly speaking more than 6 different line combinations as you can bet 7, 8 and 9 with 10, 11, 12 as in image 5, or with 4, 5 and 6. In image 6 all the four bets discussed above are demonstrated. A single on 13, a split on 9 and 12, a corner on 1, 2, 4 and 5, and finally a line covering 25 – 30. A £1 stake is placed on the single and split, and a £2 stake is placed on the corner and line. This reflects the odds of winning, with less money placed at the longer odds bets, and more money placed at the shorter odds. Total stake is £6. In image 7 the number 30 spins in. This means the line bet covering 25-30 wins at 5/1. This returns £12, comprising £10 profit and £2 stake. As number 30 came in, tis meant the single, split and corner all lost, with a total stake of £4. This means the spin ended in a £6 profit. Had the other numbers spun in (for example the £1 on 13 at 35/1) profit would have been higher. It is possible to cover a third of the board by backing columns or dozen bets. These cover 12 numbers, and have specific boxes to place chips in outside of the number area. In image 8 a column is bet on with number 1, 4, 7, 10 etc covered. In image 9 a dozen bet is shown, with numbers 25-36 all covered. Both columns and dozen bets pay out at 2/1. 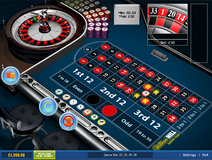 A popular method is to bet two column or dozen bets together covering 24 numbers for a return of 1/2. In this case if one bet wins the other will lose. However the wins will outweigh the lost stake. For example if placing £10 each on two dozen bets, if one wins the return is £30 (£20 profit) and the loss is £10, giving an overall return of £30 (profit of £10) from a £20 total stake. Image 10 shows a strategy of backing two dozens and two columns. £20 is staked on each bet meaning £80 in all. The dozens are placed in the boxes named 1st 12 and 2nd 12, this effectively covers all numbers 1-24. The chosen columns are placed in the two outside boxes where the stake of 2 to 1 is written. Image 11 shows the result of the spin shown in image 10. The number 19 spins in which is in the 2nd 12 and the left column. This was covered in both bets meaning each £20 bet returns £60 (profit of £40). As two dozens and two columns were covered the £20 is lost on each of these. Each bet wins £20 profit, so £40 overall for the spin (£80 stake turns into £120). Had a number not covered by either the column or dozen chosen (for example the 28 which would have won on columns but would have lost on dozens) the return would be £60, so a loss of £20. Even money bets are the far outside of the board. The comprise high/low, red/black and odd/even. When making even money bets half the board is covered. The return is double the stake, so £50 gets £100. As the roulette wheel has a zero this gives the house a slight edge. 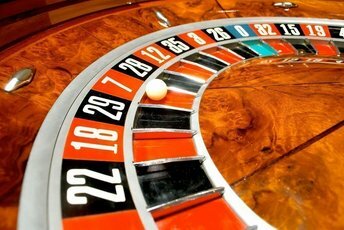 If the zero spins in most roulette will return half the stake on even money bets. In image 12 black is covered, and black numbers cover a scattering across the board between number 2 and 35. If any of thee numbers land the payout will be paid equally. Image 13 shows a set of bets on three even money selections. Low (i.e. 1-18), red and odd are covered for equal stake. In this case a handful of numbers are low, red and odd which would win all three bets. Similarly a handful are high, black and even which would lose all three bets. If the spin wins two bets this will be a net profit as the profit more than covers the loss. Similarly if the spin wins one bet (and losses the other two) this will be a net loss as the loss is greater than the returns.